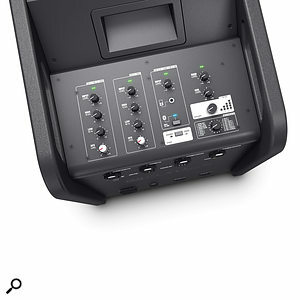 LD’s latest PA range combines the benefits of a line–source sound system with a flexible and modular design. 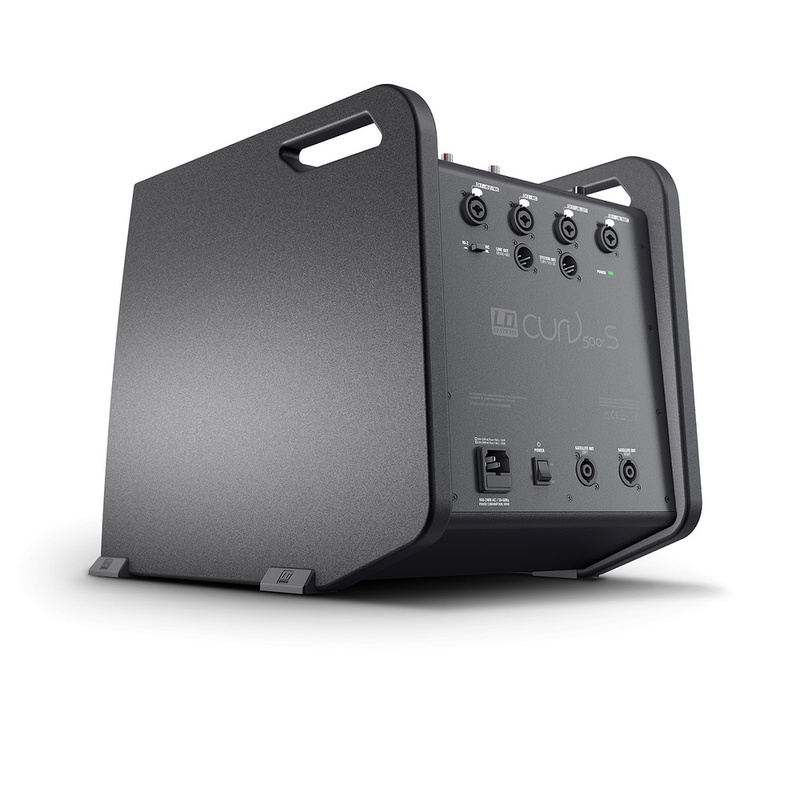 LD Systems’ new Curv 500 is a compact and lightweight (around 22kg max) modular sound system, which can be purchased in three configurations for either mono or stereo applications. All follow a familiar format, with a powered sub feeding up to four compact, passive 16Ω satellites. The smallest configuration comprises one sub feeding two satellites in stereo, and you can go up to a two–satellites–per–side stereo variant. We received the four–satellite, mono ‘ES’ (Entertainer Set) for review, which would be well suited for solo/duo acts playing in bars, but also has other applications including dance studios, schools or AV presentations. Although LD are a German company, Far Eastern manufacturing is used to maintain a competitive price. A frequency response of 47Hz to 20kHz is specified, and the total system power is 460 Watts, producing a sound pressure level of 128dB (peak; around 120dB continuous level), making it suitable for small–scale, full–range applications or as a vocal PA for use in smaller venues. A rotary switch on the sub’s control panel configures the internal DSP to optimise the system for one, two or four satellites. Each satellite locks to the next via a rugged sliding latch, which also carries the necessary electrical contacts; the lowest satellite locks to the top of a SmartLink adaptor for converting a Speakon feed to power the satellites above. This adaptor also includes a pair of sockets for the included pole mount, which fixes to the top of the sub. Which pole socket you use depends on how many satellite speakers you have, as they are set at two different angles. In addition to the subwoofer/mixer and the satellites, our review system included one SmartLink adaptor, one speaker cable, an IEC mains cable and a mounting pole. With four satellites mounted together, the system takes on some of the character of a line array due to acoustic coupling between the speakers. This, in turn, changes the overall frequency response characteristics, hence the need to switch the sub feed to match the number of satellites. The WaveAhead vertical driver configuration endows the satellites with a claimed 110 x 10–degree (horizontal by vertical) dispersion. The front face of each satellite measures only 12cm square, but they are built into tough, powder–coated aluminium cases that slot together to form a gently curving array. Each satellite speaker houses a four–inch driver plus three one–inch tweeters; you can’t see them through the metal grille, but the three tweeters are arranged in a vertical line, and mounted in front of the four–inch driver. This driver arrangement is given the title of WaveAhead technology, and we’re told it achieves a dispersion of 110 degrees in the horizontal plane but only 10 degrees in the vertical plane (for an individual speaker). This is helpful in difficult spaces as it allows you to put the sound where it needs to be, rather than spraying half of it onto the ceiling and floor. An included short cable connects one of the two satellite outputs from the sub to the base of the SmartLink adaptor; the sub’s left and right satellite outputs are on separate Speakon connectors, though only one is used in a mono setup. For fixed installations and desktop applications, a terminal block connector is provided on the back of the SmartLink adaptor. Power for the satellites comes from the power pack in the sub (325 x 383 x 491mm), which can drive up to four satellites in mono or two pairs of two in stereo. To expand the review system for two–plus–two stereo use would require only an additional SmartLink adaptor and a floor stand. The SmartLink adaptor has a proprietary pole–mount format and so won’t fit a standard speaker stand. 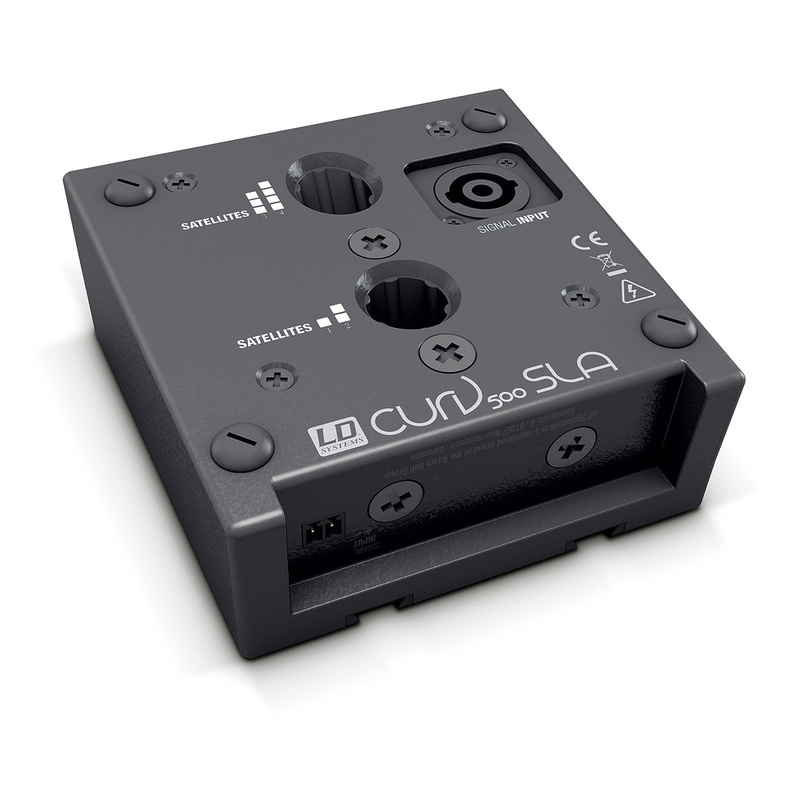 The SmartLink adaptor clips onto the lower–most satellite, and passes its Speakon input through to any other satellites connected to that array. 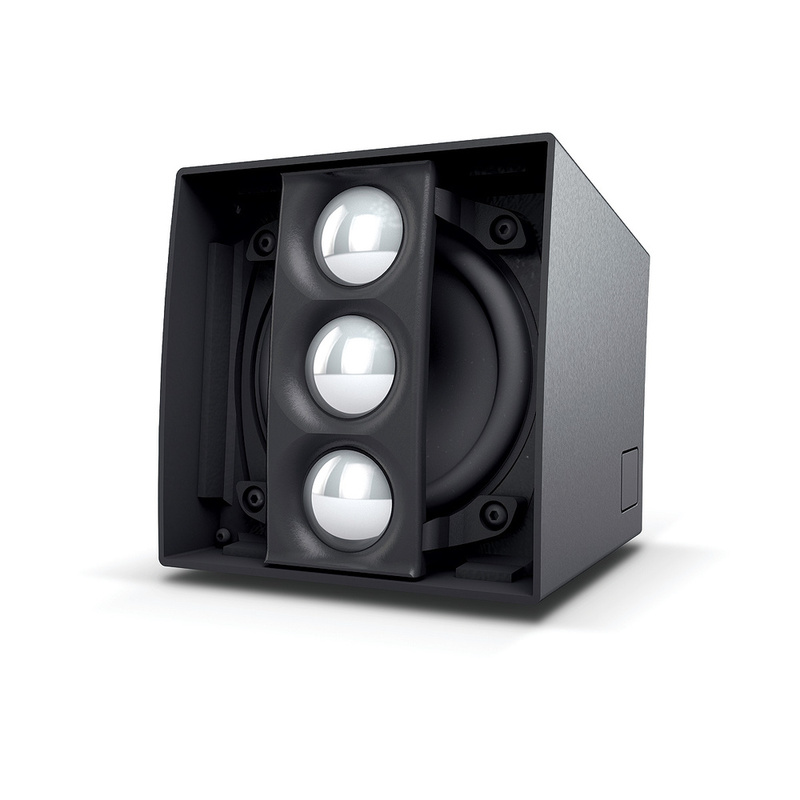 The bass–reflex subwoofer is built around a 10–inch driver and uses DSP–controlled, Class–D power amplification to provide limiting, short–circuit protection, and to guard against overheating and over–voltage conditions. Power can be from 100 Volts to 240 Volts, and two audio connections are provided for the system output: a five–pin XLR socket to connect an additional Curv 500 SE subwoofer or the Curv 500 PES Power Expansion Set, and a three–pin XLR line output to allow expansion or integration into other sound systems. A ground–lift switch is fitted. The sub is built into a plywood cabinet with three carry handles, and the controls are located on the top panel and the main connections are on the rear. A simple four–channel stereo mixer is built in and includes 16 digital effect presets as well as basic EQ, though there’s no channel panning. Audio can be streamed in from a mobile device via Bluetooth, which is useful for those needing backing tracks or interlude music. A mono switch on the mixer configures it for mono use when no second–channel speaker system is connected — as was the case for our review system. This sums all channels, effects and stereo inputs to mono. ‘Combi’ jack/XLR sockets handle the mic/line inputs for channels one and two, with channel three/four being arranged as a single stereo channel that can accept either left/right singles on separate ‘combi’ inputs, via an aux stereo mini–jack feed (wired in parallel with the main inputs), or a Bluetooth feed. If you use an external mixer to handle more channels, it could feed into inputs 3/4 leaving you with two free mic channels. A button and LED facilitate Bluetooth pairing. The top panel houses the controls for the built–in four–input mixer. Channels one and two have high and low shelving EQ controls plus a send to the effects section, and all channels have an input level control. The mono/stereo button is located at the bottom of channel 3/4, while a master control section provides a main level control, a sub level control, switching for one, two, three or four satellites, and a rotary selector for the preset effects. These comprise mainly reverbs, delays and combinations of the two, though there are a couple of options that also include chorus. Setting up the system is easy enough, and the satellites lock together very firmly, so I’d be inclined to leave them joined and then store them in a foam–lined plastic toolbox or similar for protection while in transit. The curved array when four satellites are used means that you can set the speakers up fairly high yet still get good coverage at the front for those close to the speakers; the top speaker faces forward while the bottom one is angled down at around 30 degrees or so. I tested the system at a party, where several musical acts would be performing to around 70 guests, and the LD system, set up close to a corner, covered most of one room while an adjoining space was covered by one of my Schertler 150 Watt powered speakers. The rear of the sub is where you’ll find the audio input and output connectors. Music retains rather more clarity than might be expected from a typical small PA system, with a clean mid-range, more-than-adequate bass weight and open–sounding highs. This characteristic carries over to vocals, delivering a very natural sound with none of that plastic–speaker ‘boxiness’ that sometimes intrudes. A miked cajon showed the subwoofer as being more than capable, and even when things got lively with the addition of electric guitars and electric piano, we always had plenty of vocal level, with fewer feedback worries than usual. The effects work well and deliver the kind of quality you might expect from a modest hardware reverb unit, though as we so often find in mixers of this type, many of the reverb presets have longer decay times than might be considered ideal. Even so, there are enough usable ones to add a suitable gloss to vocals without overdoing things. A pair of these systems would probably hold their own in a band context for smaller gigs, but the Curv concept really shines when handling more discerning material at a moderate level. It sounds great on acoustic guitar and vocals, keyboards come over cleanly, and while the lows might not challenge those of an 18–inch sub, there’s still plenty of depth for most applications without the system sounding strained. For duo and trio bar gigs where you need an almost hi–fi sound, a stereo setup with two satellites per side would probably be the best option, while this mono system might be a more practical choice for performing in a tight space or for other mobile applications, such as dance classes or presentations. Given its build quality, portability and sound quality, the cost of the system makes it very attractive, especially if you need something that’s easy to carry and set up. You might look at any of the smaller line–array systems such as the HK Elements packages or Bose L1 Compact, and where deep bass is not required, there’s always the Fishman SoloAmp, though I haven’t come across anything in this price range that offers as modular an approach as this LD rig. Directs the sound where you need it. This is a well thought–out system that allows you to buy the mono or stereo configuration that best meets your needs. It is well suited to high–quality, moderate–volume bar gigs and suchlike. €1099 (approx £826) including VAT.